What are dental implants? Are they right for you? Often seen as a purely cosmetic measure, the many types of dental implant open to you can actually help restore stability to a mouth with missing teeth and ensure continued oral health well into the future. Today, Vitality will take a closer look at the fascinating world of dental implants, and how they may well be the key to reinventing your smile forever. Dental implants are an option available to help you replace missing teeth, creating an artificial tooth [or set of teeth] which are attached to the bone. While they share some similarities with both crowns and dentures, the ability to implant a prosthetic tooth directly into the bone like a real tooth is a very welcome addition to the smile-boosting technology in your dentist’s arsenal. Before we look at the different types of dental implants at your disposal, let’s take a closer look at the anatomy of a dental implant. The typical dental implant closely resembles an actual tooth- that’s part of their allure. The part which will be visible once the implant is added to your mouth is also called the ‘crown’. This is specially shaped based on the size and shape of the missing tooth, so it will fit naturally into your line of teeth and sit well in your mouth. It’s typically made of durable and attractive ceramics, and is made to look natural. If relevant to your needs, this may be a bridge or even a full or half denture instead. Below this, invisible once placed, is the connector or ‘abutment’. This part of the dental implant is used to firmly seat the crown on the base, and ensure a close, secure fit. The base itself works similarly to a bolt, featuring a titanium post which will sit stably within the bone matrix of the jaw for extra security. Are dental implants only for single teeth? Not at all. 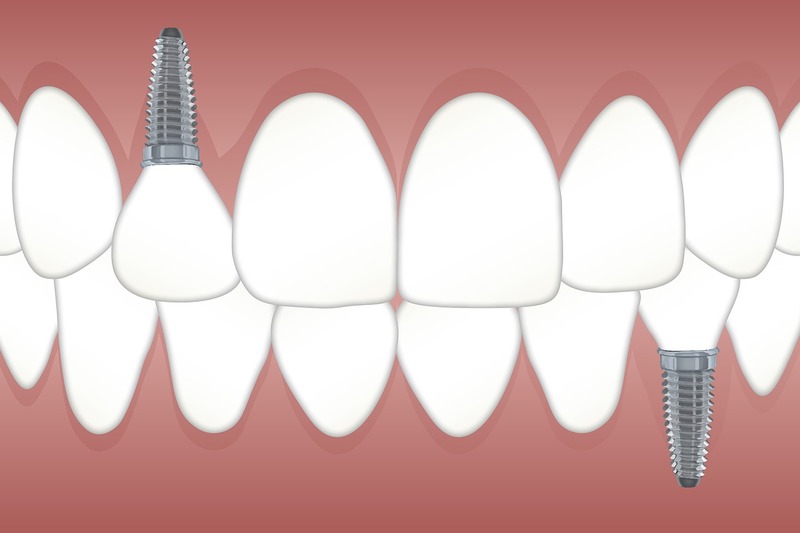 While your classic image of a dental implant may well be of a single tooth, the secure posts that form the base of the implant can be used to anchor crowns, bridges and dentures too. There are a number of good reasons to consider dental implants. Perhaps the most compelling is because of the natural look they provide- we can almost guarantee no one will ever know you have had part of your smile repaired and replaced! Whether it’s one tooth or many, they are a versatile and attractive option. They can even be used to create a sense of permanence and stability for dentures, taking away their perceived drawbacks and making them much more acceptable and convenient. The cosmetic benefits aren’t the only benefits, however. They also restore your ability to properly chew your food. Gaps in the teeth place considerable strain on the surrounding teeth, and this can impact how you handle food and even how you speak, as well as make remaining natural teeth vulnerable to damage and decay. No matter the type of dental implant you opt for, it’s likely to be a life-changing dental experience. Will implant placement hurt or be scary? Not at all! The dental implant is generally fitted under local anaesthetic, as with all oral surgery, so you won’t feel a thing during the process. If you’re a nervous patient, you can request sedation too. Vitality is used to handling nervous patients. It does sound a little scary on paper, but in practice – and in the skilled hands of your dental practitioner – it’s a simple process. At least three appointments will be required. At your first appointment, a small hole is drilled in your jawbone, and the base is carefully screwed into place. The gum will then be carefully pulled shut around it to facilitate quick healing. This will only take an hour or two, and the site may be a little tender afterwards but that will soon subside. Biological integration now takes place- your body will heal around the post, providing you with a stable, permanent attachment site for your dental implant. This will take up to three months. Once the site is well healed, your second session will be booked. This is where your smile will be ‘restored’. Moulds are taken of the implant position, then the missing tooth [or teeth] will be replaced with the dental implant. The connector will be fitted into the base of the implant so it sits securely. The crown will then be secured into place usually with a small screw. The end result will be a totally natural smile once again. There are a few different types of implants available to you, so it’s important to choose a dental practice that adheres to high standards. Here at Vitality we offer a complimentary local dental consultation to discuss the procedure with you and answer all your questions. Dentists have been restoring smiles with dental implants since the 1980s, when the technology first became available. We offer flexible appointment times to suit any schedule, and dental payment plans can be made if required. If you are not in our area, then make sure you use a certified, experienced dental practice you can trust. It’s equally important to ensure they use an implant type which is known for its long-term success. Here at Vitality it is our mission to ensure you have a healthy smile you can be proud of. From keeping your existing teeth strong and healthy, right through to helping you make best use of measures such as dental implants to ensure you look and feel great, we’re here to help. Why not get in touch and book your complimentary appointment to discuss the right dental implant for you today?